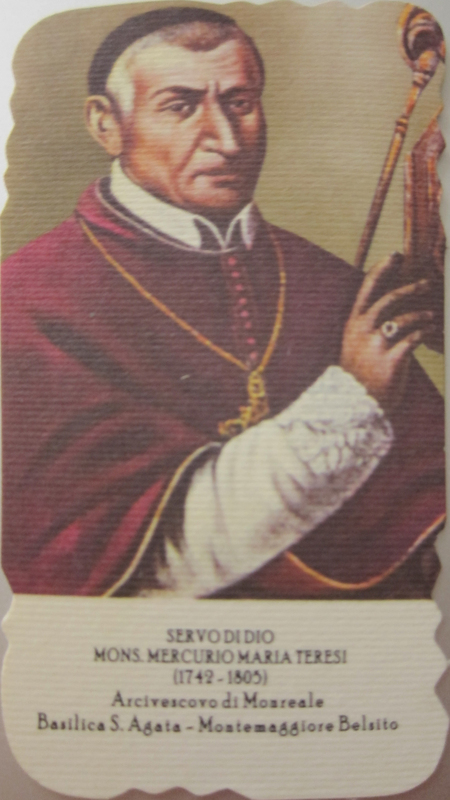 Monsignor Mercurio Maria Teresi was born in Montemaggiore in 1742 and is somewhere in the early stages of being considered for sainthood by the Catholic church. My great-grandfather Rosario Millonzi's grandmother was a Filippa Teresi born in 1813. We could be related to a future saint. We learned this visiting Montemaggiore Belsito, home town of Rosario Millonzi, my great-grandfather, and Carmela Parisi, my great-grandmother. My grandmother and my uncle were also born there soon before they all emigrated to the US in 1920. According to http://www.monsignorteresi.it, with the help of google translate, he was born 10 October 1742 to Cruciano Teresi and Margaret De Nasca in Montemaggiore Belsito. Two of his uncles, Don Antonio and Don Philip Teresi, were priests. He apparently showed singular piety, but was denied study to the priesthood because he seemed dull of mind. But after constant prayer before the statue of Our Lady, it was said that she laid her hand on the back of his head and he received such an intellect that at 18 years of age he had written his first work on the Immacolate Conception of Mary, followed from another book written at 20 years of age. He undertook and completed his studies in theology at the Jesuit Collegio Massimo of Palermo. In April 1765 he was ordained priest by the Bishop of Cefalu and immediately returned to the diocese and was appointed Spiritual Director and Professor of Moral Theology at the Episcopal Seminary of Cefalu. Two years later he left the Chair and the seminary to pursue priesthood with all the enthusiasm to the Saints missions. He spent nearly forty years of his life evangelizing the vast Diocese of Sicily. First he went to Nicosia, where he stayed for a whole month, then reached Mazzarino, Newfoundland, Sperlinga, Palermo, Messina, Catania, Siracusa, Agrigento, Mazara, Monreale, Palermo, etc.. He paid this feat with great sacrifices, hardships, dangers and misunderstandings of all kinds. Although overwhelmed by the apostolic work, he learned the value of spare time in order to write and publish various works of a theological, ascetics, enriched by historical thoughts and lessons learned from the Fathers and Doctors of the Church and the texts of Sacred Scripture. In 1797 he was appointed parish priest of Montemaggiore Belsito for about 5 years. The fame of sanctity reached the ears of King Ferdinand III of Bourbon and his wife Queen Caroline who wanted him to attend their court as a preacher and confessor, recognizing in him the man of God who spread the word and works with the "bonus odor Christi ". Ferdinand III was captivated by his words and example of his life. Bishop Teresi, spiritually linked by a great affection to the Society of Jesus, said the return of the Jesuits in Sicily and also the restoration of the Archdiocese of Monreale, abolished in 1775. Both the favors were granted in 1803 and in obedience to the Pope and the King accepted the post of bishop of Monreale. Although the charge did not alter his style of apostolic life, continuing to favor the poor. He led with firmness and gentleness, the archdiocese and died April 18, 1805 in Monreale. Tradition says that in the same hour in which he died (the 2 am) the bells of the parish church of Montemaggiore Belsito, which he had raised to a minor basilica, gave themselves the announcement of his death. "The fame of holiness of Mary Teresi Mercury" as said by Pope Pius XI in the Papal Bull with which raised the Monreale Cathedral Basilica Minore 28 August 1926 "in recent times has increased and extended everywhere." Yesterday, my family visited my great-grandfather's home comune – and now our home comune – of Serradifalco, Sicily. I had sent a letter to the municipal office – the same office I wrote to ask for birth certificates – telling them that we would be visiting and included a copy of our recognition letter from the Detroit consulate. We walked into the "municipio" and I asked "parla Inglese" to which, not surprisingly, the answer was "no". So I said "mi chiamo" and told them my name. Well, the person obviously recognized it immediately – "oh, oh, oh" – and then there was a whole team of people happily greeting us. My Italian is very limited but I could catch a bit here and there. They had received my letter. And apparently, the fairly extensive paperwork from the Detroit consulate had only just arrived so the chief clerk had not yet reviewed it. As she was looking it over (and it was quite a lot), she was asking me if my father or grandfather was registered in the A.I.R.E. and I told them no and tried to say that my father and grandfather did not ever know that they were Italian citizens. The office was aware "conoscere" of the concept of "jure sanguinis" but it seemed like they had not had anyone get recognized that way in Serradifalco. They said it would probably be about a month before they would mail me a copy of our birth certificates and marriage certificate. While we were there they gave me copies of my great-grandfather and great-grandmother's birth certificate – I had them already of course and did not ask for them but they kindly gave them to me anyway. I did ask if they had my great-grandfather's home address. They pulled the old book out and I got to see his actual birth record from 1886 – I had seem it on microfilm but it was cool seeing it in person. I had told them that I had no cousins in Serradifalco. My great-grandfather and all of his brother's had emigrated to America (well, one stayed back, but he apparently had no children). Well, when they deciphered the address they told me that there was another "Palmeri" living in that same home now. Perhaps my great-grandfather and his brothers – or their parents – had given the house to a cousin since no one was living in Serradifalco anymore to take it? While they could not get in touch with the people who were living there, they did find their son (?) who happened to live right next to the municipal building. Not only did these distant cousins (?) give us an amazing lunch of antipasto, pasta, and rabbit, but we met other cousins (? ), saw the home my great-grandfather was born in, and we got to see the main church and some of the town. It seemed like my cousins (?) were intrigued to find out if we really were cousins. They said that no one from the Palmeri family who emigrated to America ever kept in touch with Palmeris still in Serradifalco. That probably means trying to find out if we share a great-great-great-grandparent who was born around 1800. Or perhaps a great-great-great-great-grandparent who was born in the 1700s. Maybe. There are lots of Palmeris around Serradifalco. But the fact that one was living in my great-grandfather's home was intriguing. Once we get our birth certificates from Italy, we can get passports for me and my sons. Here a link to information on the Detroit consulate's web site. A passport is both a travel document as well as a form of identification. It's issuance/extension is of the responsibility of the Passport Office in the jurisdiction in which an Italian national resides. The passport is renewed/issued to Italian citizens who are legally resident (see Registry information) in this Consulate's area of jurisdiction. As of the 26th of October, the Consular offices and the Italian Police Headquarters (Questura) are issuing a new type of passport; an electronic one. Since regular passports issued as of the 21st of January 2003, have a validity of ten years, those who have a passport issued under these conditions (optical passport) will be able to request that the validity – even after the electronic passports have started to be issued – be valid for the ten years from the date it was released. After ten years, the passport must be replaced by a new one. It is important to underline the fact that the old type of passport (optical passport), even having been renewed, does not guarantee entry into the United States if one does not possess the required documentation of entry. Therefore, those who would like to enter the United States without needing any further immigration documentation will have to present an electronic passport. – an optical passport with a digital photograph released by the Italian City Hall between the dates of October 26, 2005 – October 25, 2006 (Consulates have not issued optical passports with digital photographs). A passport is issued/renewed to Italian nationals who are legally resident (see Registry information) in the jurisdiction of this Consulate. Issuance/Renewal to residents and non-residents is dependent on this Office receiving the necessary authorization(s) from the competent Consulate and/or Police Headquarters (Questura) in Italy. In order to issue/renew your passport this Consulate is also required to perform the necessary procedures prescribed by current laws: identification of the applicant; verification of Italian citizenship and military draft status; acquisition of parental consent from both parents for passports issued to minors; Acquisition of Consent, from the other parent, for the issuance/renewal of passports to parents with minor children (except in cases where the applicant already has the consent of the other legitimate parent who resides in Italy and from whom he/she is not legally separated). "Cohabiting" parents enjoy status comparable to legitimate parents, if they reside in Italy. In all other cases, the authorization of the Probate Court Judge is required. You are required to pay a tax of $ 51.00 (dollars) for the renewal/issuance of your passport as well as a $ 54.00 (dollars) for the new booklet. This Consulate has the authority to withhold your passport, or deny its issuance/renewal, under certain cases prescribed by law. Examples include when the person: is subject to a sentence restricting his personal liberty; is required to pay a fine; is subject to detention or preventive security measures; being 19 years of age, has not regularized his military draft status. In instances where your passport has been withheld, or issuance/renewal denied, you may appeal to the Ministry of Foreign Affairs within 30 days or to the competent "Regional Administrative Tribunal". As of November 25, 2009, minors will no longer be added onto the passports of the parent (or guardian or person otherwise authorized to accompany them). b) that their pictures be routinely updated: the validity of the passport for minors differs depending on the age (three years for children from 0 to three years; five years for minors between three and 18 years of age). In the case of minors who are already registered on currently valid passports, these will remain valid until the expiration of the passport itself. Nationals who request a new passport will have to present their photos and all required documentation by mail. An appointment (click here for appointment request form)will be made with nationals to take their fingerprints once the necessary authorization is received from the competent police headquarters (Questura) in Italy. All nationals are also required by law to sign a form at the Consulate containing information regarding the security of personal data maintained in this office and the Ministero dell'Interno.A copy of this form will be given to the national when their new passport is issued. – Application form, duly completed and signed by the applicant. – Acquisition of Consent (Atto di Assenso) and a copy of a valid ID from the other parent, for the issuance/renewal of passports to parents with minor children (except in cases where the applicant already has the consent of the other legitimate parent who resides in Italy and from whom he/she is not legally separated). – the amount of $ 54.00 (dollars) cost of new booklet + $ 51.00 (dollars) issuance fee. In the event of a stolen or lost passport, a divorce, or for any additional information, you are kindly requested to contact this Consulate by telephone at (313) 963-8560 ext. 16-17 or by e-mail. * Duly completed A.I.R.E. form (Registry of Italian Residing Abroad) for new applicants and if address/composition of family/other have changed since last time. The above Certificates must be submitted in certified copies legalized with "APOSTILLE". Our family leaves on our trip to Italy this afternoon. I am attending a conference in Sardinia for six days, then we visit Sicily for eight days, and then Rome for five days. While in Sicily, we will be visiting the home commune of the Palmeri side of the family, Serradifalco, and the MIllonzi side, Montemaggiore Belsito. We hope to pick up copies of our birth certificates and marriage certificate in Serradifalco. If we can, then we can get passports and start the jure matrimoni process for my wife.